One of the most important insights from ecology is that the relationships between things are as important as the things themselves. A healthy vibrant ecosystem is a mass of connections and relationships. That’s what we are trying to create with a permaculture system. For example, food for a household might be provided by a diversity of main crops, wild food, salad and vegetable beds, orchards and soft fruit, agreements with other producers, small and large livestock. If any one source fails, others will provide. This increases the systems ‘resilience’ and makes failure or disaster less likely. Many conventional and industrial systems tend to look at ‘elements’ (e.g. a chicken) as producing only one yield (eggs or meat). This single yield is then promoted and extended often at a cost to the environment and the element itself. In a permaculture system we are trying to utlise all the different functions and yields of an element, e.g. a chicken can provide pest control, tillage, meat, feathers, eggs, heat etc., to increase the overall yields and create a more integrated system. In order for there to be good connections between different parts of the system, it is important to place them so that they can do this. An obvious example is that a rainwater collection barrel is generaly best placed next to the downpipe from a house, or chickens next to annual beds that need occassional tilling and pest control, or herbs next to the back door for easy picking for your next cup of tea! The patterns found in the natural world are a source of inspiration for permaculture. ‘Pattern thinking’ can be used in a wide variety of situations, unlike specific techniques which can only be used in particular situations. 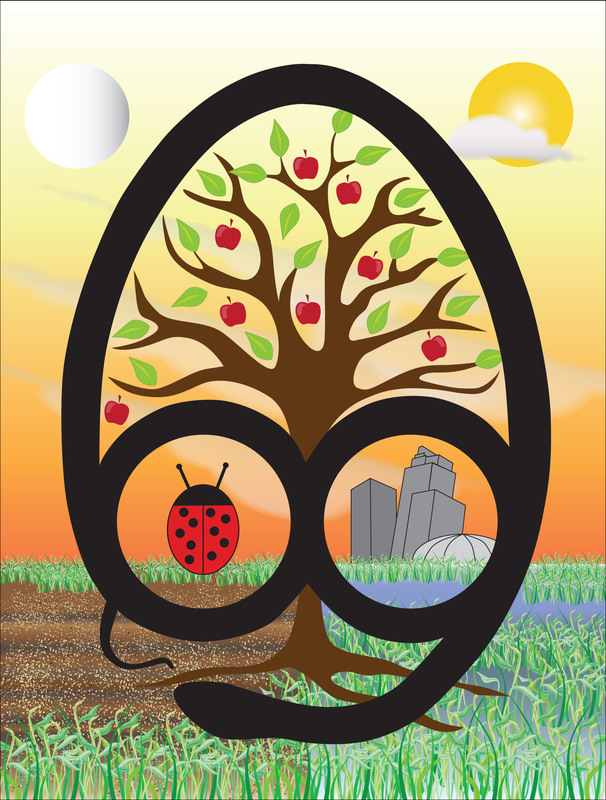 Permaculture aims to help you think about the overall pattern for a project by using a variety of design methods. The principles themselves are all about helping to do this. Its about looking at the ‘big picture’ first. The biggest picture thinking all relates to what we are trying to achieve, which is where the ethics come in. Zoning is a very good example of a design method that is used to help generate an overall pattern for the site and ensure that it is designed to be energy efficient. Sector analysis is another design method used to see how energy (sun, wind, wildlife, etc) flows through a site. Both of these tools help to give an overall shape to the design, before getting too carried away with the specific details to start with. Crowned Prince of Permaculture Geoff Lawton speaks on permaculture. Permaculture Principles 6: Produce no Waste. Waste is just an unused output. If the output is unusable, or downright dangerous, we probably shouldn’t be producing it in the first place (plutonium for example). Careful maintenance and investing in good quality long lasting products can also help reduce waste and overall consumption levels. As they say “refuse, reduce, reuse, repair, recycle”. We could add re-design in there too, which is where permaculture makes its biggest contribution. Please comment or hit me up on twitter @freedomfarmtv Lets keep the conversation going. As societies we need to value ‘ecosystem services’ such as water purification much more highly. Currently we are destroying natural ecosystems that would provide us with many thousands of years good service if we were to treat them with more respect. This principle deals with the self-regulatory aspects of permaculture that limit or discourage inappropriate actions and behaviours. An obvious example of this is that permaculture has a set of ethics that aim to regulate how permaculture designers and practitioners behave, in particular that we accept limits to our consumption so that we do not take more than the earth is able to provide. Self-maintaining systems are the ‘holy grail’ of permaculture, and can be seen in designs for forest gardens, in which work is minimised by planting ground covers to reduce weeds, nitrogen fixers to replace fertilisers and perennial and self-seeding plants to reduce annual plantings. This is a work in progress and we are very keen to hear about your designs and systems. I’ve posted a few design principles. Well here is a nice video about the principles. Permaculture stresses self-reliance – the ability to meet many of our own needs from our own resources. In a high rise flat that might be a window box with lettuces, as a whole community it may be the majority of our food. We can no longer rely on global food systems to meet our needs, or on there always being enough fossil fuels to bring the crops to us. Permaculture stresses the use of plants that are functional – food medicine, fibres, but this doesn’t mean boring or dull. Functional designs and plantings can also be beautiful – another important yield. As Bill Mollison says: “The yield of a system is theoretically unlimited, or, limited only by the information and imagination of the designer.” Put another way, ‘obtain a yield’ is not something we do once, but rather an approach to how we run our homes and design our settlements. Its a creative process and means that we are always looking to see how we can make an improvement here, add another species there. With high yielding homes and settlements, we can meet our needs with less land. Then we can give some back to the many other species that are currently being ‘squeezed out’ by our current energy and land intensive agricultural systems. Worms may not have a backbone, but they are the backbone of our soil. 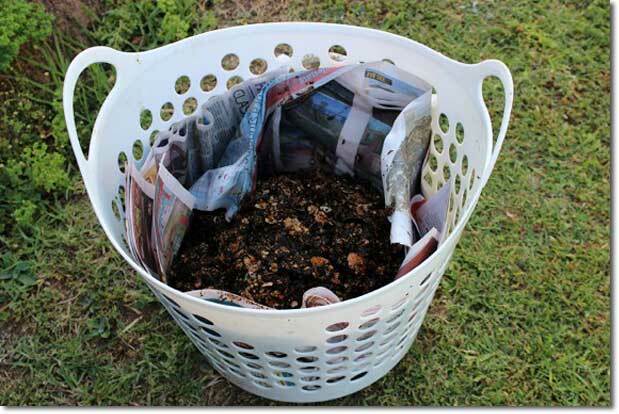 In a suburban garden with no manure-providing animals, being able to dig into your composting worm farm for a handful of black gold is a real cost saver and loop closer. So giving some thought to how that worm farm fits into your overall Zone 1 system — as a time, effort and space-saving soil fertility provider — is time well spent. This low cost worm farm tractor, or stand-alone worm farm set up, relies on a sturdy container that can be moved comfortably by one person, and remain intact while you do so. This is because you often have to move it in areas that are ‘standing room only’ in the confines of your urban plot. I now have four of the following worm farms, but the worms are breeding so fast on one family’s kitchen and garden scraps, cardboard, paper, and coffee grounds, that I’ll be adding another unit to my tractor soon. The limitations to using the tractor setup are climate and shade coverage. For example in harsh Australian summers I can only put a worm tractor in my shaded beds or shaded service areas. Young systems will not have enough shade in summer, so find your best shady area and site them there. If you do so higher up in your backyard, your beds will gain from fertility flow if you leave the lower bowl component off to allow nutrient leachate to exit the bottom. For cold climate areas the farms go indoors into garage or basement in winter and there the lower bowl is a must, so there is no leakage from the unit. These units can be used as a worm farm tractor or stand-alone worm farm. Black plastic garbage bin with handles. Drill drainage holes in the bottom and two sets of 5 holes on top of each side of the lid. Laundry basket with handles (fits inside garbage bin.) Drill holes in bottom. Laundry bowl (no holes) fits inside the bottom of the garbage bin, under the laundry basket. As mentioned above, the bowl is an optional component, because you remove this if you have the worm farm in tractor mode in a garden bed, allowing leachate to drain straight into the soil through holes in the laundry basket and bin. Add the bowl for indoor use. Line the laundry basket with dampened newspaper. The holey laundry basket keeps enough air circulating and the newspaper stops the worms climbing up and out, and the castings from going into the bowl. Put your worm bedding material inside the dampened newspaper lining, then your worms, and let them settle for a day. Cover the top of the worm/feed layer with dampened newspaper. 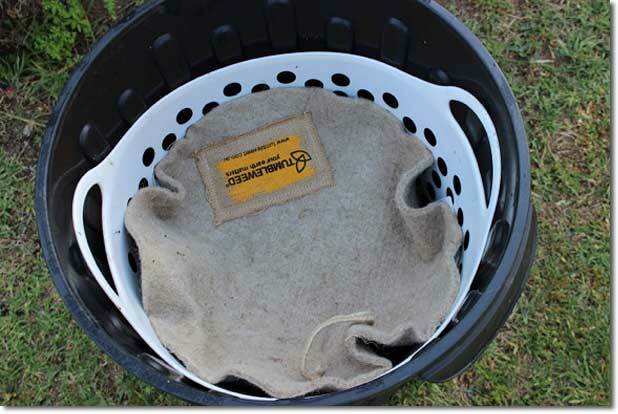 I also include a dampened circular commercial cover (hessian wool blend) which helps to moderate moisture, then put the lid on the garbage bin and park in the shade. Start introducing small but regular amounts of minced kitchen scraps (food processed) onto the top of the worm farm. Minced scraps reduce wasted space in the bin and help the worms turn the scraps into castings quicker. The resulting castings are even, for use in soil amending and potting mixes. Avoid hot concrete paths or any surface that might cook the contents of your worm farm. Do not use metal bins either, for this same reason. Parked at different convenient shady spots in your Zone 1 garden, and moved often, like a chicken tractor, the fertility drains straight into your garden bed. Over time, provided there is shade, whole garden beds can be improved. The worms survive even if they crawl out the drainage holes because they have their perfect home and kitchen to return to when they need it. 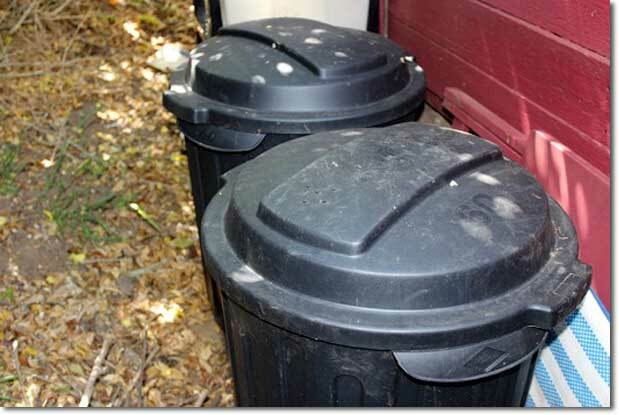 As enclosed systems the bins move easily without dismantling or messy clean-ups. Some more independent young worms lurking outside the drainage holes can be scooped up and returned home before their parents knew they were out. The farms are easily lined up in a safe cool place when you go away, with no maintenance beyond a feed and dampening mist, if necessary, before you go. The whole farm can be harvested by lifting the inside laundry basket up by its handles, taking the newspaper lining out with worms in it, and leaving it in bright (not hot) light on a table top. The worms then shy away from the light and head to the bottom, after which you can harvest the castings from the top and put the worms back into the bin with new newspaper lining in the laundry basket and some new bedding. Mincing the scraps means the area to contain them is small; the worms get through them quickly (an advantage in small space worm farms). Disabled gardeners would find this system more manageable by reducing the size of the bin to suit their physical capacity. In about a month you’ll have worm castings to harvest for garden amendments or potting mix components. You can ‘bandicoot’ handfuls to soak for garden foliar and soil sprays. 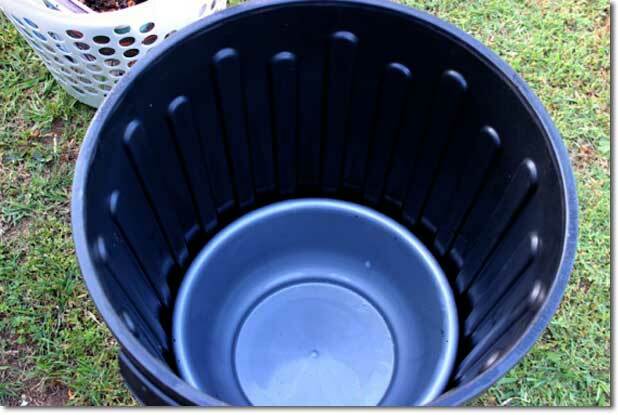 The bowl collects excess worm leachate, which can be emptied on the garden or lawn as you choose at a high point in the backyard, to filter down with soaking. I prefer soaked castings to make my garden foliar and soil sprays. Well, I haven’t encountered any yet, in a 12 month-old system of four farms. This method is an improvement on the ‘chuck and forget method’ I used for 20 years with my worms breeding under-utilised in a compost bin directly on the soil in a shady garden spot. My new method helps me spread fertility around the garden evenly and effortlessly. The system is easy to handle, in small chunks, when I get time. Use or adapt this idea to suit your own needs, and please let the rest of us know how you went in the comments section below. The vast majority of energy is supplied by the sun which is then captured by plants who have learnt the clever trick of how to turn photons into complex carbohydrates. This basic trick drives the whole planet’s ecosystem. We need to rebuild ‘natural capital’ in order to create the basis for a long-term sustainable society. As permaculture designers we are helping to arrange our landscapes to maximise this energy capture. This is mainly by planting and nurturing new areas of ‘biomass’ – living things – mainly plants, usually as trees, woodlands, forest gardens, meadows, ponds, etc. Wherever possible we are also seeking to ensure that plant systems contribute to the development of deep healthy soils. Deep soils allow good crops, retain more rainfall, and also have the hugely important role of being the world’s largest and most important living stores of carbon. We can design our buildings to catch energy too. Passive solar techniques are used to face buildings towards the sun, so that sunlight can help heat homes and provide light for free. Active solar technologies like solar photovoltaics and solar water heating can also catch the sun’s energy and store it in well insulated water tanks and batteries.